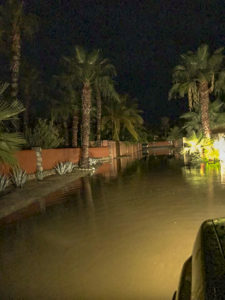 Discussion in 'Baja Bytes By Gary Graham' started by Baja Bytes, Sep 25, 2018. 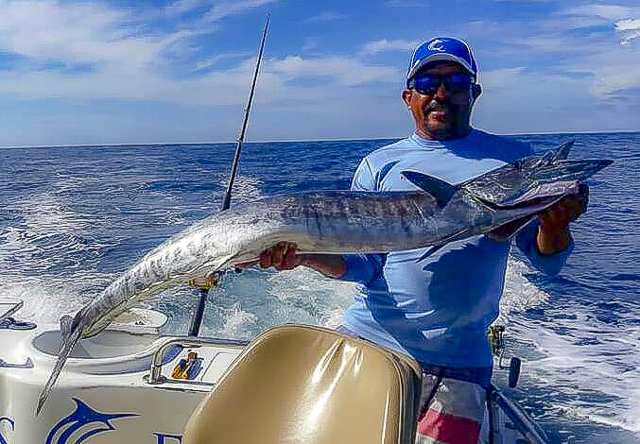 September in Baja lived up to its reputation for squirrelly weather again this week as rain squalls (not hurricanes) put a dampener on fishing for the better part of the week. 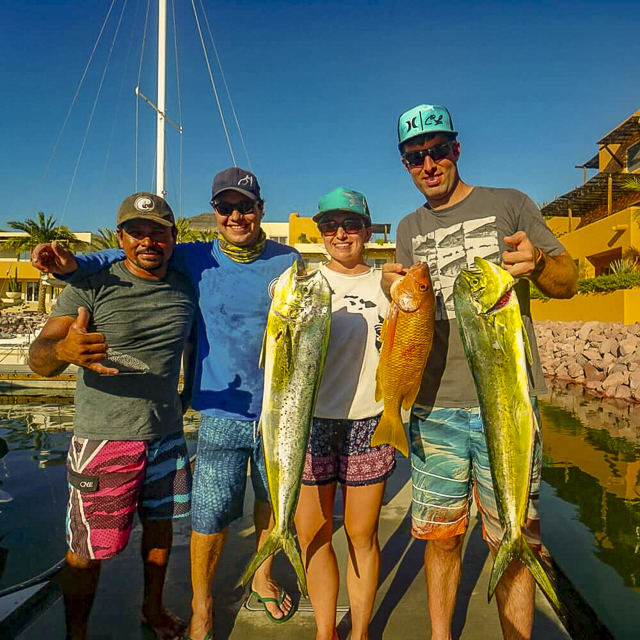 By Friday, weather improved, and yes, the yellowfin tuna dominated catches from the tip to La Paz, while the upper part of the Sea of Cortez suffered more from a lack of interest than a lack of fish. it was game on for wahoo, dorado and you guessed it — more yellowfin. Trolling along the outer edge of the kelp beds found along the shore have been yielding an occasional yellowtail to spice up the calico bite; also, watching for the bird schools is a give away to where the fish are feeding — barracuda, yellowtail and bass that might be chasing the bait to the surface. From there towards the International Reef, there are scads of big bonito also feeding on the surface. 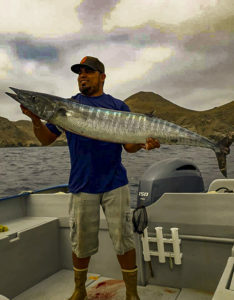 Good fishing for that same 5- to 7-pound bonito that has invaded the entire south coast all the way to Ensenada. Yellowtail fishing, however, isn’t very good. It is slow now after a wild spring and summer. There are no reports of bluefin recently. The last ones seen/caught came from the area between Ribbon Kelp and the 5 Minute Kelp. Here is where the fleet of sport boats along with private boats are loading up on yellowfin and skipjack. Some of the better stops are coming off kelp beds but the boats are also getting plenty of jig stops, finding fish on sonar marks and from finding breezers and bird schools. The northern zone is just a little east of the 425 (FMM permits required), and the southern zone is between the 425 and the Hidden Bank (outside the 12-mile FMM zone). Inshore surface action throughout the bay has been a steady pick for bonito, barracuda and a few yellowtail for the few boats fishing recently. However, the almost always reliable go-to bottom fishing assures limits of lingcod, reds, sand bass and rockfish to fill the coolers. 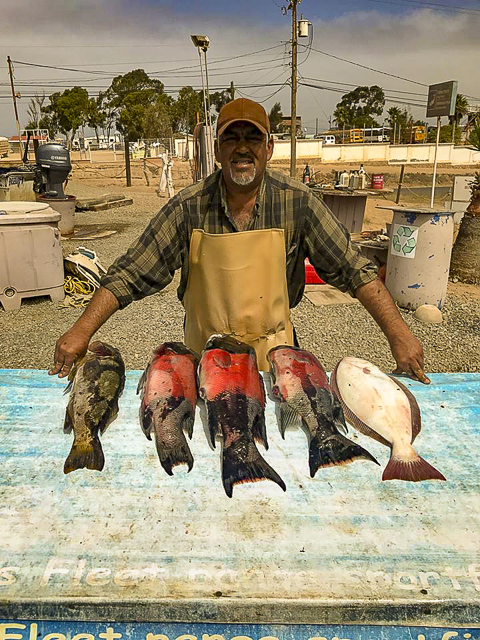 Farther offshore, outside the Islands, the kelp paddies are holding dorado, yellowtail and some yellowfin tuna down deeper in the water column — maybe 50- to 100-feet. Schools of yellowfin can be found mostly of the smaller variety with a few up to 30-pounds mixed in. For the adventurous, there are striped marlin hanging around some of the high spots to the north and south up and down the coast. Offshore has been hit or miss for most. One day there will be yellowfin tuna and maybe even a dorado or two in the count and then everyone gets fired up and runs outside the 240 and comes up short. Squirrely weather, erratic sea-temp, off-color water all seem to get honorable mention for the condition. So far, the inshore has been much more productive — small to medium yellowtail, and more big bonito that seem to be consistent all up and down the coast now. And of course, for the meat fishermen, bottom fishing is always a reliable alternative with some nice-sized lingcod, reds and other rock fish to add to the catch. The wahoo and yellowfin were biting Rapalas at Benitos recently. There’s great fishing at the island right now. 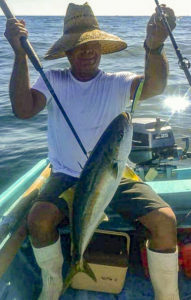 Yellowtail and dorado on the south end high spots. Live bait, Rapalas, and surface iron are all working. Calico fishing is fantastic with 75- to 100-fish days not unusual. Plastics and stick bait are your best bet and bring plenty. What does Juan do on his day off? — at La Bufadora Inn. Hot weather seems to have thinned out the number of visitors to the area. Hence, sketchy reports would indicate that there is live bait near the launch ramp. 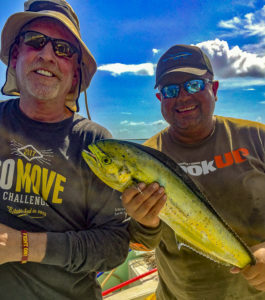 The dorado are still in the zone on the surface and again anything floating is the key to finding them while you are trolling lures. Most of the yellowtail are being caught around the pinnacles around the outer islands. Inshore along the shore trolling rapalas in shallow water can be productive, particularly during the summer when creating your own breeze helps keep you cool while you are catching cabrilla, spotted bay bass and who knows what else. “Consistent action for dorado south of the airport” … that’s the word this week for the boats on the prowl for fish catching. 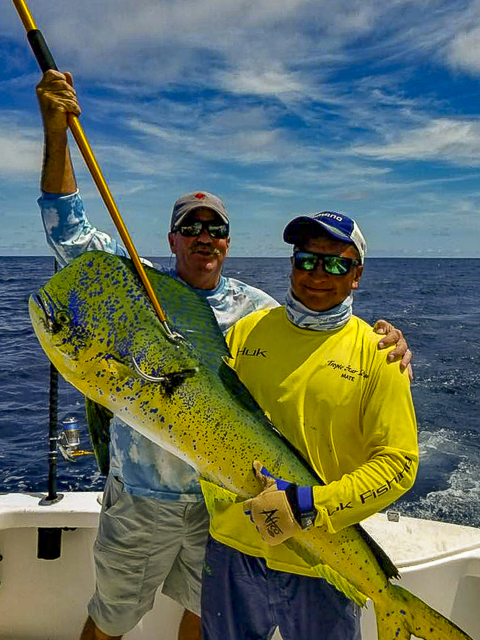 Medium-sized dorado have been pretty much a sure thing from Nopolo to Juncalito ever since the rain system moved out. No big fish but bait and feathers put most pangas on to limits. I heard radio chatter this afternoon from boats working farther south from Danzante to the north side of Monsarret Island. Mostly the same with nothing out of the current specifications – medium-size fish from 8 to 15-pounds.The commercial hand line guys are sitting on the usual high spots catching snappers. Although the days are getting shorter, it has still been great weather; the sun is still a roaster but the high temperature periods are down from 18 hours to 3 or 4 hours per day. Rene and Paco are great. Took us out fishing and swimming yesterday. Boat comfy. The landscape is delightful. Caught two dorado and saw a whale and a couple of pods of dolphin. Rene is very knowledgeable and a great guide, and the nicest person! Smooth ride out did not see any life on the way out got to the bank and within five minutes we got four way on wahoo landed all four ,little after 10 AM Start throwing wahoo bombs hooked several but did not land any on that stop on the bombs started trolling again picked another double on the troll, through bombs again a lot of follows but no takers, started trolling again got another three-way landed two lost one, start throwing bombs again a lot of follows one hook up came unbuttoned, started trolling again took a bit but we got one hook up probably the largest approximately 43 pounds Had to cut off the head to fit in the fish box of the 26 for Striper ! Ended up with eight wahoo 11:30 AM the bite stopped! Water – 86- to 88°F. Clear, flat and almost perfect. Air – Very pleasant and cool for September with daytime highs in the low 90’s and there has been some rain. 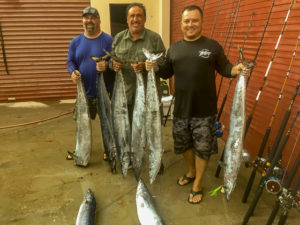 Again, it’s all about the tuna with limits for all anglers, plus there were a few dorado and wahoo taken. The inshore fishing has been stellar with big amberjack, pargo, and pompano. Big roosters are being released daily with live sardina by far being the best bait; chunk squid is also working. Yellowfin are just one to two miles off Rincon and Punta Pescadero. Both areas are producing limits from 5- to 20-pounds with the occasional 40- to 50-pound brute mixed in. Sardina are by far the best bait. Earlier there were some larger yellowfin in the 30-pound class taken under fast-moving schools of porpoise 10- to 15 miles offshore. All fell for Hoochies and cedar plugs. Only incidental catches for dorado. Inshore pargo in the 5- to 15-pound class, nice pompano and big amberjack are coming off the inside drop-offs. All were taken on squid. Big roosters in the 30- to 60-pound range are closer to the beach. My son Josh and I fished out of San Jose del Cabo. We managed 3 nice tuna that kicked our butts good. One fish was on chunk the other 2 sardina. We used small circle hooks and 50-pound flouro leader. The biggest fish went 72-pounds. After the recent rain, fleets dealt with some slightly off-colored water conditions as well as some strong currents. 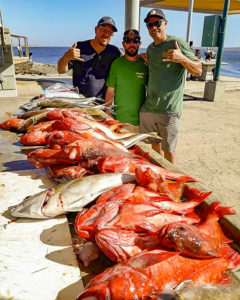 But as ocean conditions settled, water temperature was back averaging close to 84- to 85°F, and there was lots of yellowfin tuna action, mostly in the 50- to 80-pound range. However, at times they were very shy in taking any hooked offerings from anglers, though with persistence, anglers could catch two or three during a morning trip. This action was all on bait, with live or dead sardina, strips of squid or on live chihuil, (which were not a sure bet trying to catch). Despite the yellowfin tuna action being sporadic and a bit finicky, this was still the best chance for catching quality gamefish. A private sport fisher out of Puerto Los Cabos reported landing a yellowfin tuna at Gordo Banks that was estimated to weigh 280-pounds. This is the first real super-cow that has been reported from this area this season. Fishing this week has still been decent, although numbers did drop a bit compared to last week’s report. 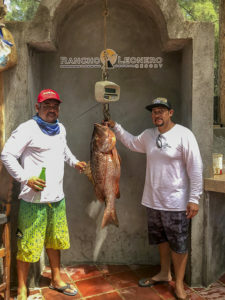 However, this may be due to changing weather here in Cabo with some rain closing the port for two days midweek and with somewhat difficult conditions, anglers tended to get seasick. Those who had no problem with the seas, however, did well, especially if they fished a few days. Although it can be slow, we’ve been surprised with big catches throughout these summer months. This was again the case this week with 31’ Tracy Ann landing a monster 250-pound yellowfin tuna. Other species caught this week were mainly blue and striped marlin, a few sailfish and smaller dorado. 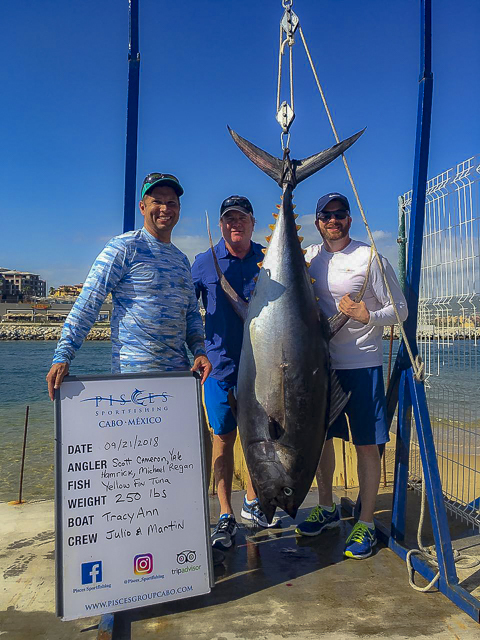 The 250-pound tuna caught on 31’ Tracy Ann was landed on September 21st, with Anglers from Frisco, Texas, Michael and Florence Reagan, Shera and Scott Cameron and Alana Geblein and Yale Hamrick having their work cut out for them this day. Not only were they one of the most successful anglers looking for tuna this week, but they also landed the big kahuna. They caught 13 yellowfin total, mostly ranging between 15 and 20-pounds, with a few larger 50-pound fish and the surprise 250-pounder which put up a good fight. They found all fish about 30 miles out at La Herradura,and hit on cedar plug and petrolero lures. 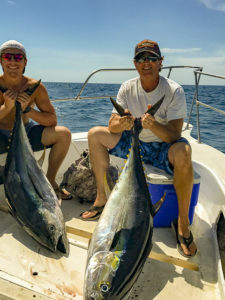 The Tracy Ann did well with tunas throughout the week, with anglers Stacy and Steven Roxberg, from Alabama, fishing a few days with the crew and landing a total of 17 yellowfin over two days. Their fish all ranged between 15 and 35-pounds each, with luck found at the 11:50 Spot on various lures: cedar plugs, hoochi and green/red lures. 31’ Tracy Ann also had luck with dorado and marlin on the 18th, landing 1 striped marlin, which they released out at Las Margaritas. 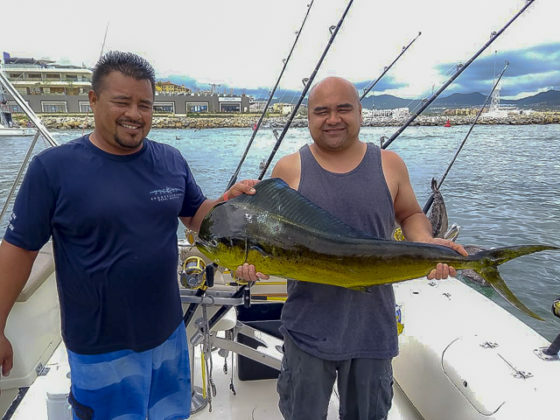 Additionally, they caught 6 dorado, all between 10 and 25-pounds each (with 2 released), which hit on feather lures and caballito bait between Los Arcos and Inshore at Golden Gate area. September 15th, Tracy Ann also did well with catching an almost 300-pound blue marlin, with anglers Dave Smith, Don Ealy, GT Mason and Robert Seamasterdoing a nice job at landing it. The fish hit on a petrolero lure out at the 95 Spot. September 16th, 31’ Rebecca also caught and released 2 striped marlin, along with 2 yellowfin tuna of about 20 to 25-pounds, all fish hit on caballito bait out at the 11.50 Spot. Pisces 31’ Ruthless and anglers Antonio de la Pena and Paula Borja came all the way from Spain! They had a good day with 1 striped marlin caught and released of about 100-pounds, 5 dorado (2 released) and 1 sailfish also released. 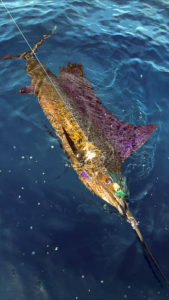 The marlin hit on caballito outside of Los Arcos, and the dorado, which ranged between (5-8 lbs released) 10 and 25-pounds hit on petrolero lures and feathers. 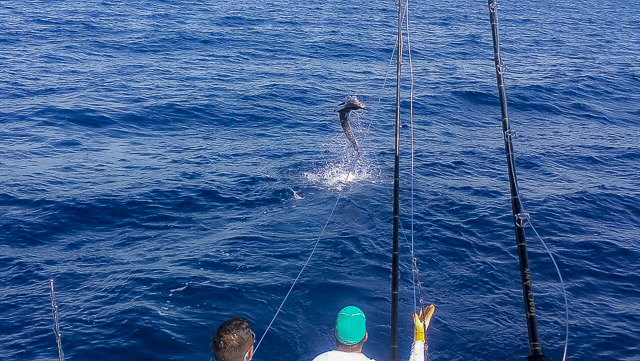 The sailfish also hit on petrolero lure. 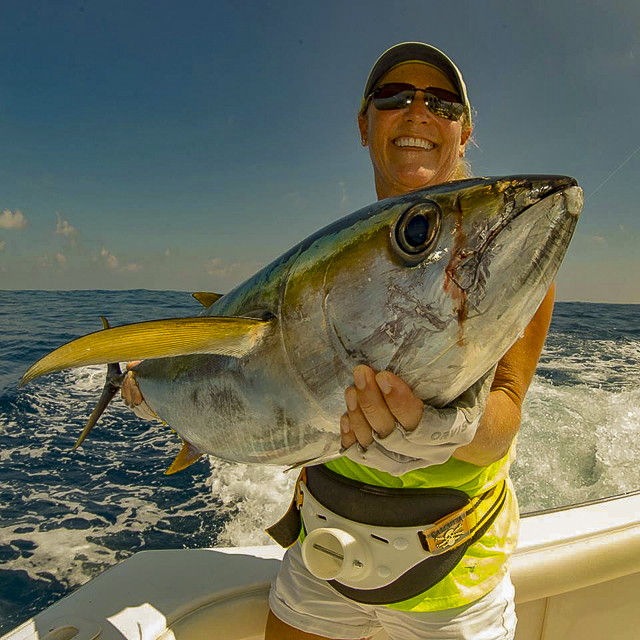 AVERAGE WATER TEMP: 83 – 86 F.
BEST LURES: Caballito and ballyhoo bait, feathers, cedar plugs and varied lures: petrolero, guacamayo, back/red..Pisces Sportfishing Fleet, Rebecca Ehrenberg. WOW great report and pics Gary. Some nice HOO's & Dorado in the mix.